I made this tutorial to help you guys out on how to install ProMods as there has been so much hassle about it. This tutorial covers only the free installation method. Click on the images to see at full resolution if necessary. 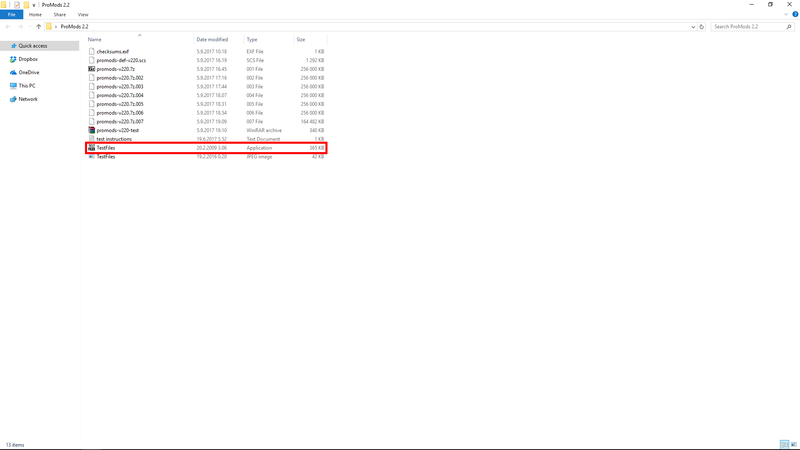 You will need 7-zip in order to extract the mod files! The browser used in in this tutorial is Google Chrome. This tutorial has been made using Windows 10 64-bit. I have no guarantees it will work the same way on other systems, but it generally should. 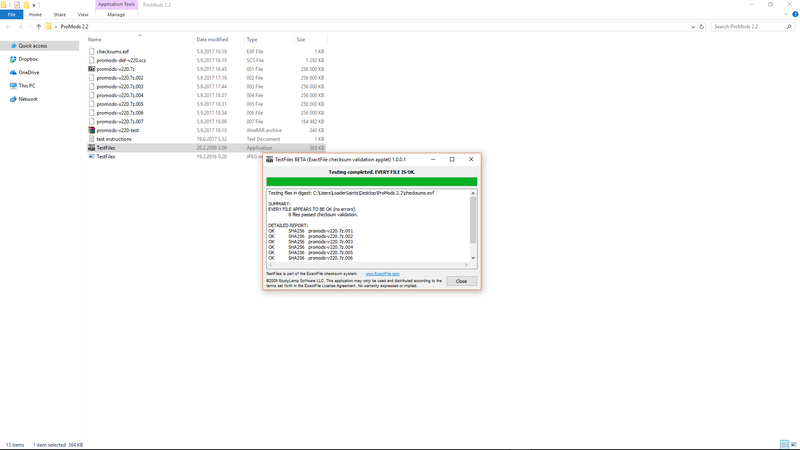 If your game crashes after installing try re-downloading the files! If you have problems installing post your issue here! If you are using MAC then you might want to check out the guide made by penguinaz available here! Click the Download button on the Board Index page. Click the link to generate your def file. It should open in a new window or tab. 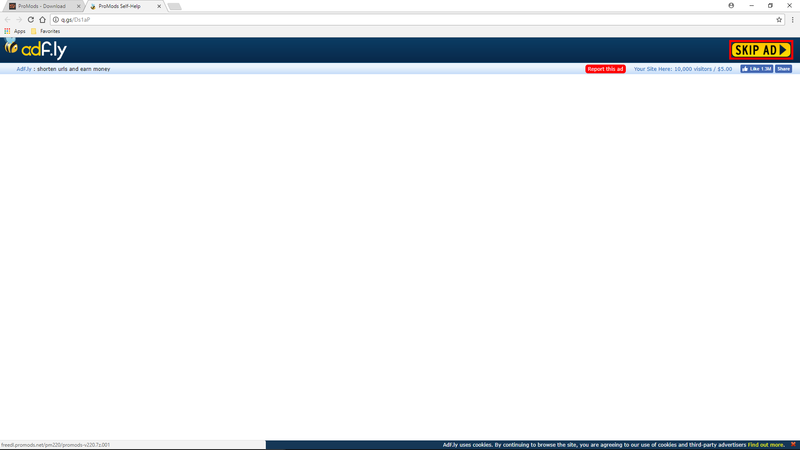 Remember to keep the other window / tab open too! Now set the Cabin interior sound level, Damage level, Vegetation drawing distance and Colour settings. OPTIONAL: Select "Check this box if you are using Rusmap" only if you are using Rusmap! By enabling this option the world map should look correct when ProMods is used together with Rusmap. Click the Generate button and download your def file. Place it somewhere where you can find it with ease. 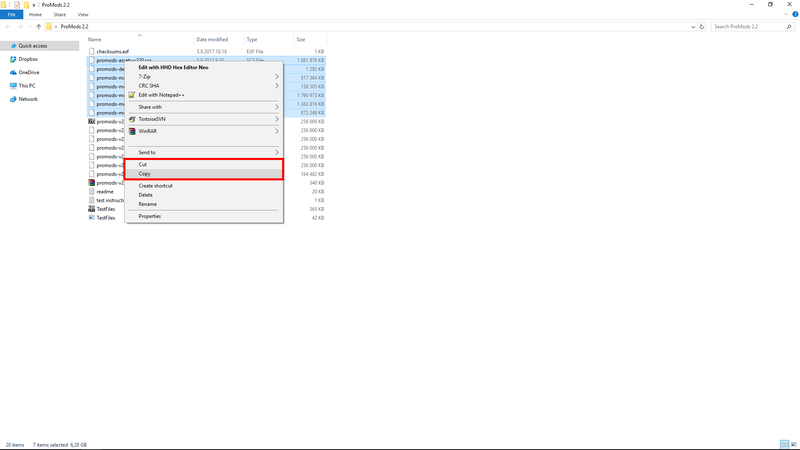 After you have downloaded your def file you can close the Download definitions window / tab. 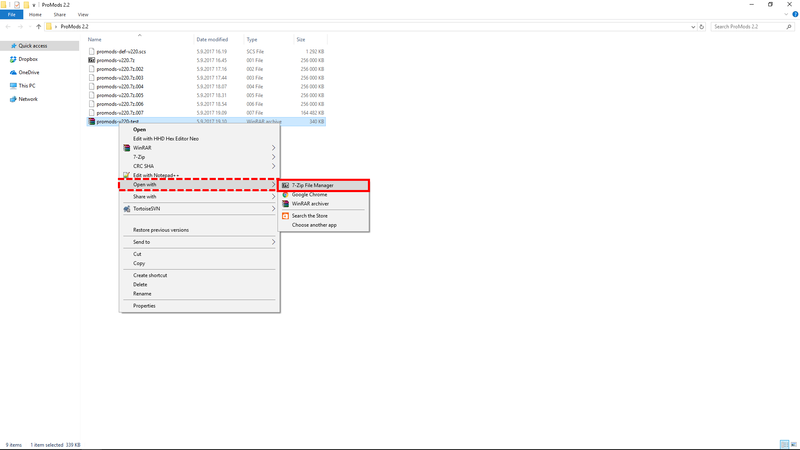 On the Installation window / tab, click Go to step 2. 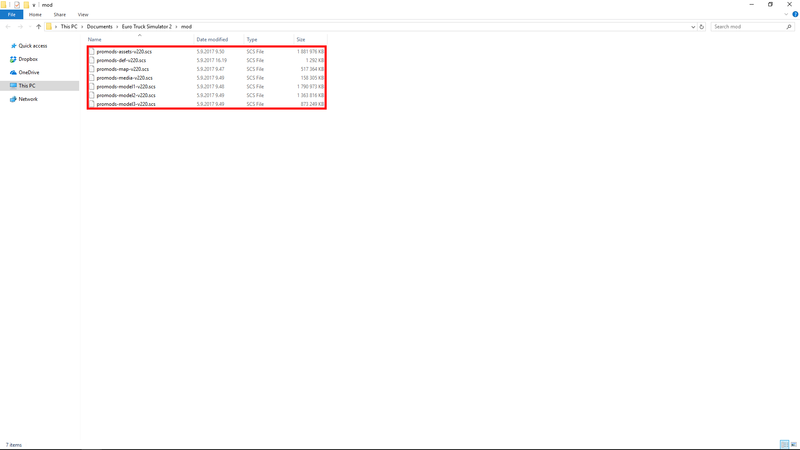 Download all seven files into the same folder where the def file is located. NOTE: You may only download 3 files at the same time from our new server! When you click one of the download links you'll be directed to Adf.ly. In the upper right corner there should be a 5 second countdown and once that is complete the SKIP AD button should appear. Once the button appears click it in order to initiate the download. If the download does not start make sure your browser is not blocking it. Repeat this for all the files! Once you have downloaded all 7 parts download the FILE TEST file. 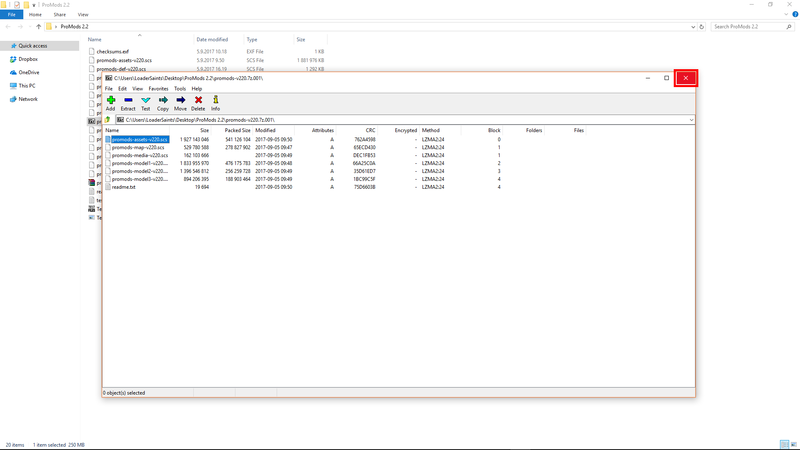 Right-click on the file and select Open with > 7-Zip File Manager. 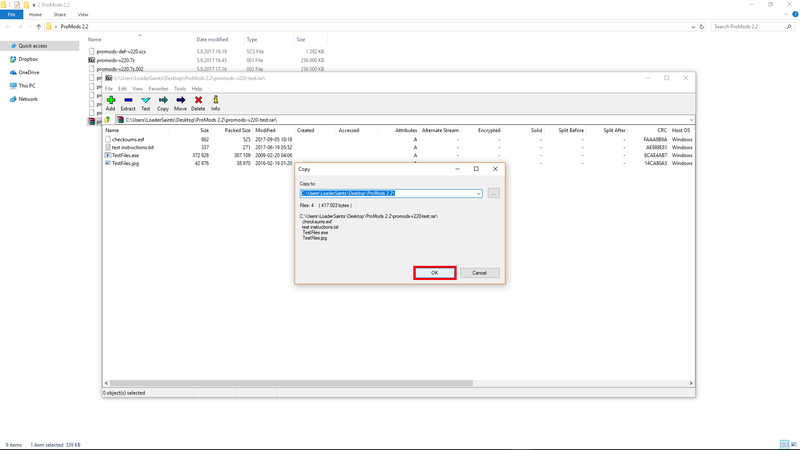 Once you have opened the file with 7-Zip click on the Extract button. Click OK in order to start the extraction process. Once the extraction process is complete you may close the window. Double-click on the TestFiles application (.exe). Make sure the application shows the exact same message as below in order to make sure the files you've downloaded are intact. If this is not the case the files are corrupt and you should remove them and then download them again! Click Close to close the application. 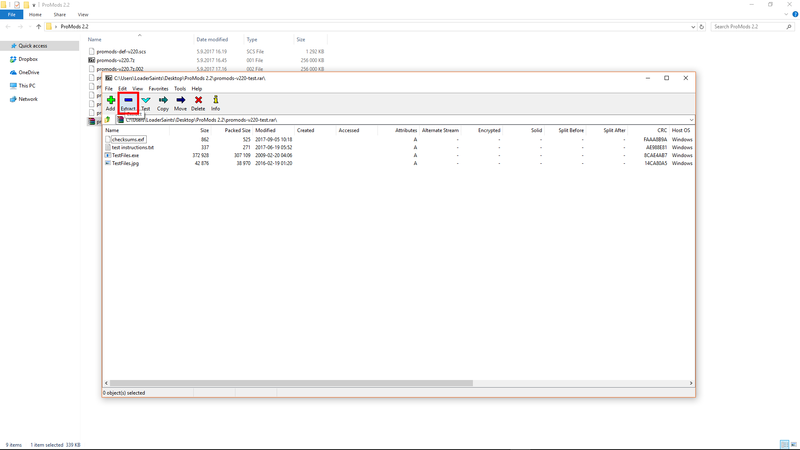 Open promods-v220.7z with 7-Zip (this file may also show up as promods-v220.001). Click OK in order to start the extraction process. This may take some time depending on your system. Now select promods-assets-v220.scs, promods-def-v220.scs, promods-map-v220.scs, promods-media-v220.scs, promods-model1-v220.scs , promods-model2-v220.scs and promods-model3-v220.scs with Rectangle Select or CTRL + Left Click. Right Click one of the selected files and choose Cut or Copy. 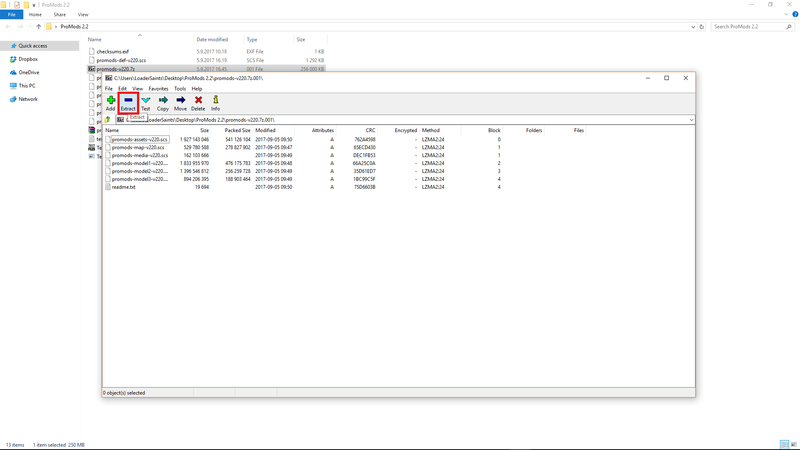 Open your mod folder (usually located at C:\Users\User\Documents\Euro Truck Simulator 2\mod). Right Click in it and choose Paste. 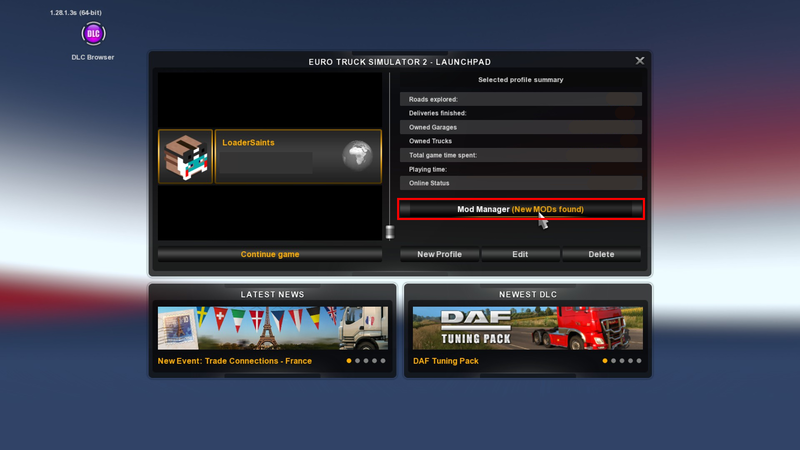 Launch Euro Truck Simulator 2. 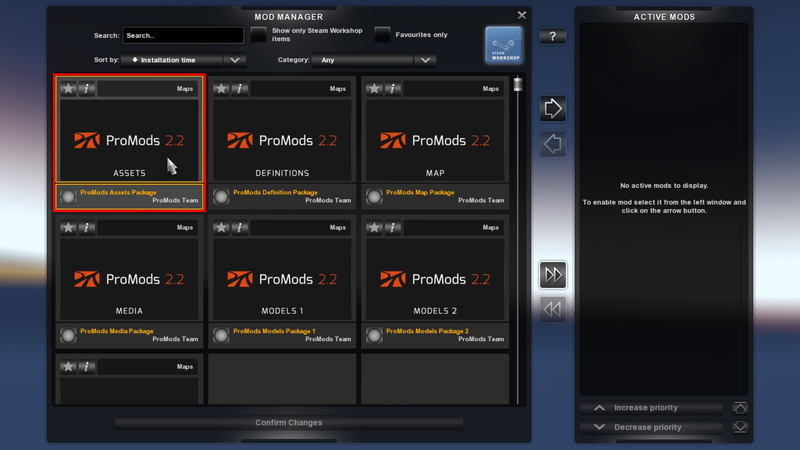 Then in the Profile Selection select the profile you wish to have ProMods in and click the Mod Manager button. 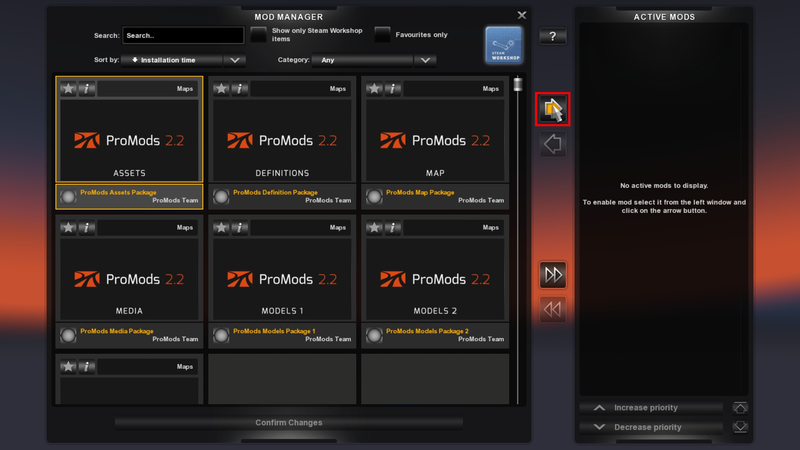 Select one of the ProMods Packages by clicking on it. Then click the arrow button in order to enable the mod package. 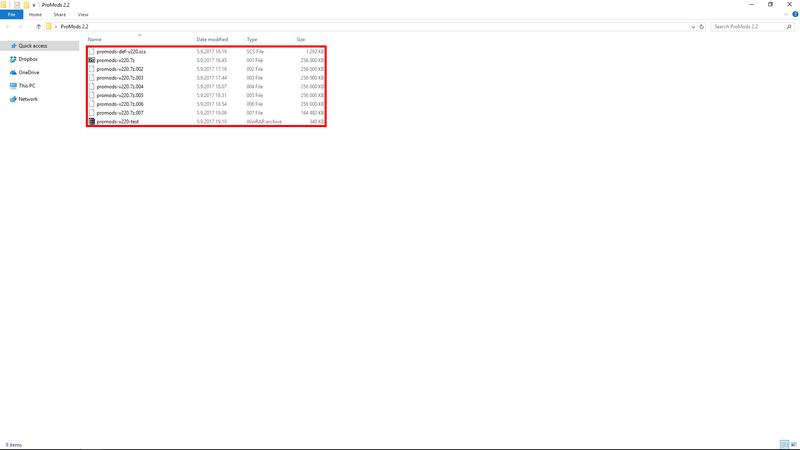 Repeat this until you have all the seven files listed in the Active Mods list like in the image below. 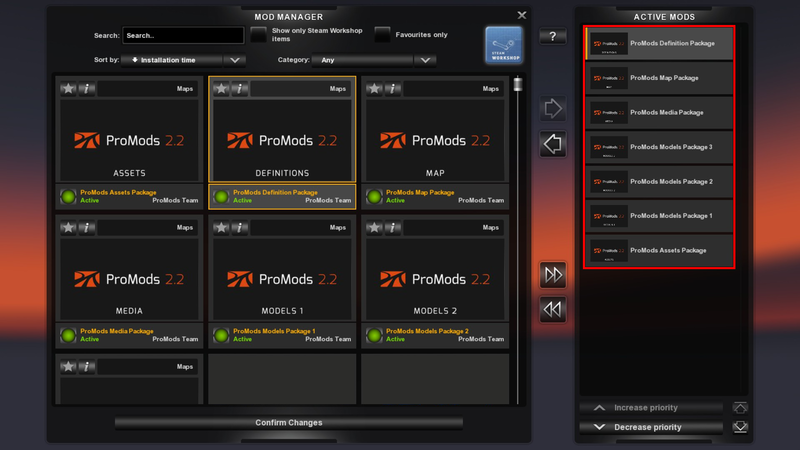 It is advised to have the definitions package at the top of all ProMods files. And finally click the Confirm Changes button. You have now installed ProMods. If you like ProMods you can support the development by donating! 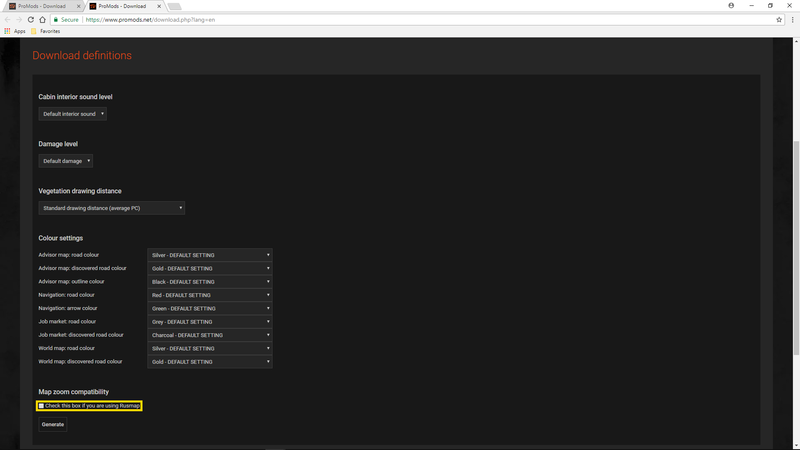 Then click the arrow button in order to disable the old mod package. 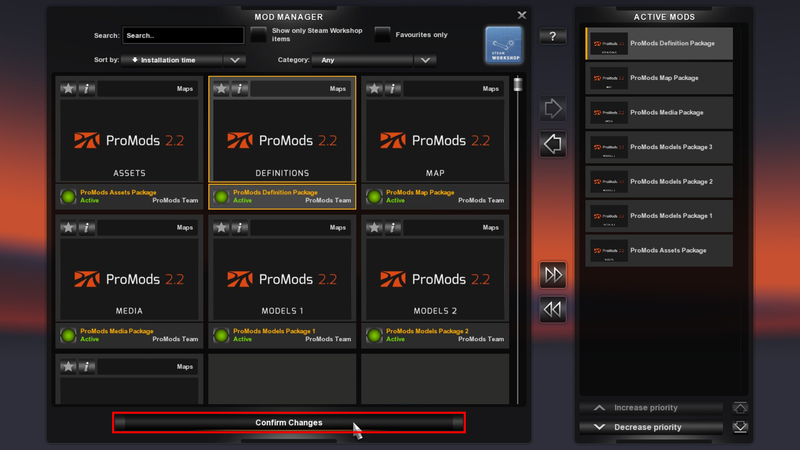 Then select another old ProMods file in the Active Mods list. Then click the arrow button again in order to disable the old mod package. Repeat this for all the old files! 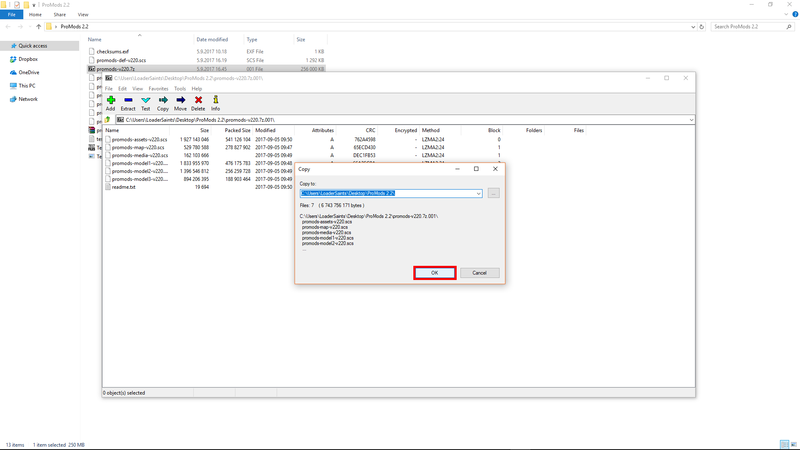 After you have disabled the old files, enable the new files you have downloaded just like in step #10 of the Installing ProMods section. 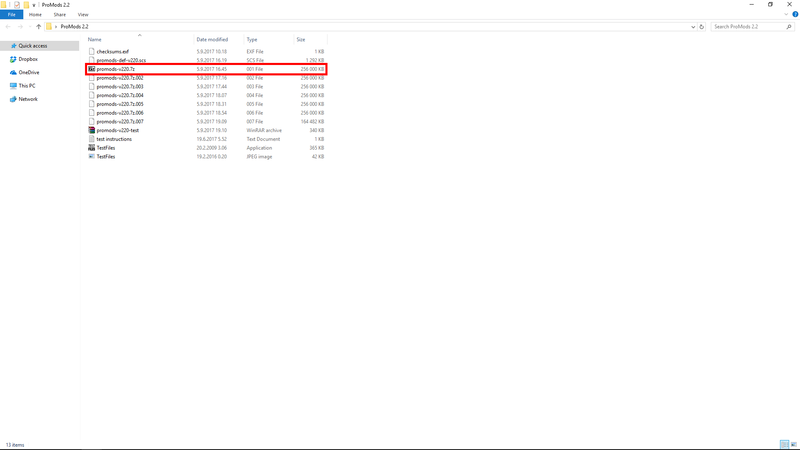 You can now remove the old files from your mod folder as only the new files are needed. Last edited by Nathan_A_RF on 20 May 2018 11:00, edited 27 times in total. This should be a sticky thread. 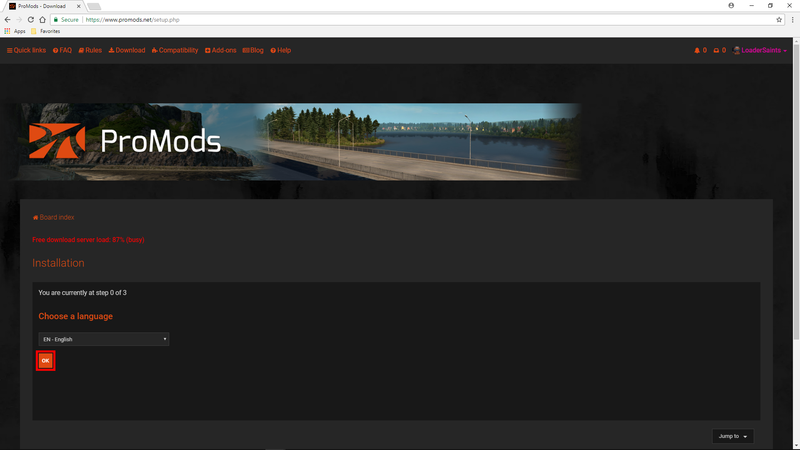 Hope ProMods guys will notice. Last edited by Jan Verschueren on 17 Jan 2015 00:26, edited 1 time in total. Reason: cleaned up post and upgraded it to global announcement. We are looking for people who can translate the tutorial in their own language! 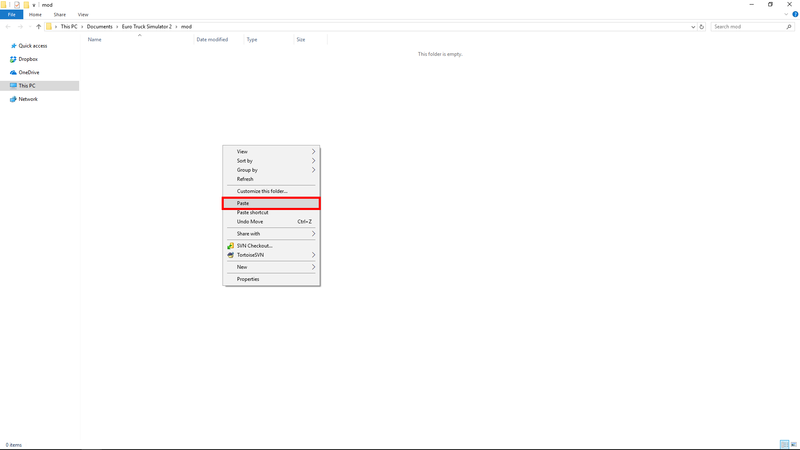 If you chose to do the free download, make sure you have finished downloading the 6 files ending in .001 .002 .003 .004 .005 .006 and then continue to the step below. 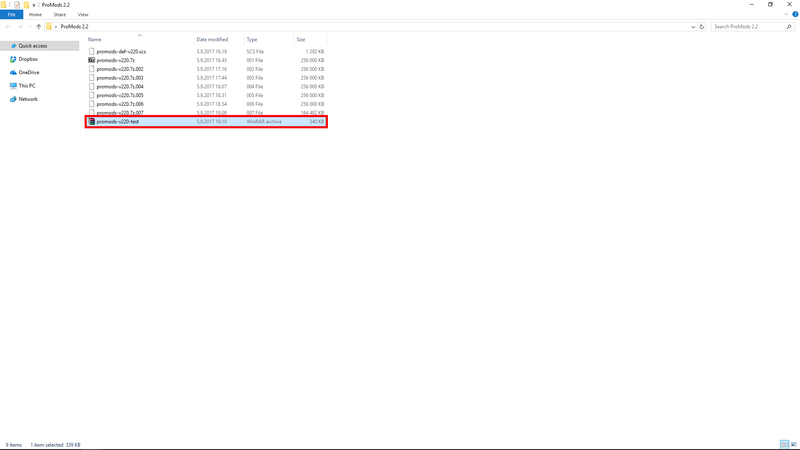 If you chose to do the $1 download make sure you have the 2 files ending with .7z, scroll down to the bottom of this post for further instructions. 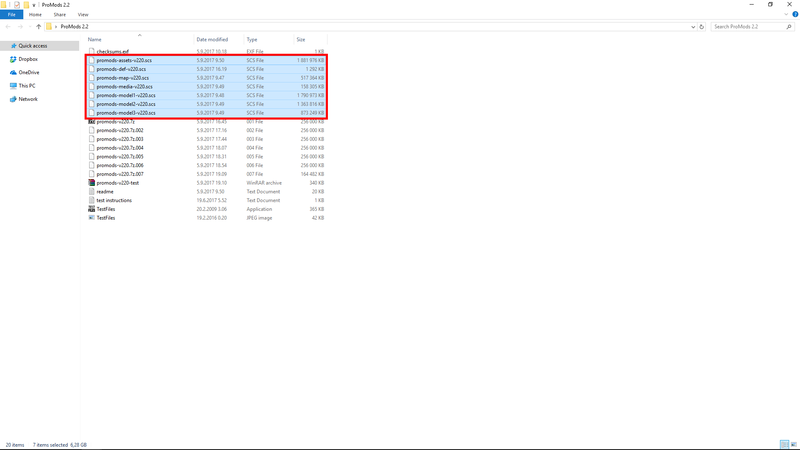 1) Look in your downloads folder, you should have 2 files you downloaded from Payloadz which ends in a .7z extension. 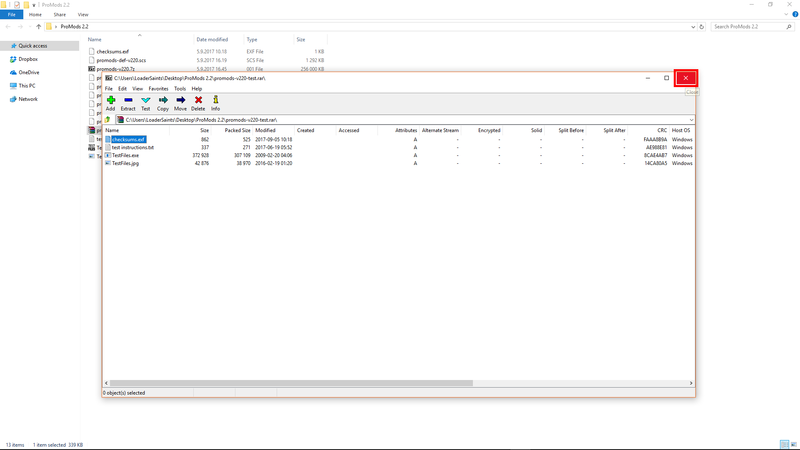 2) Right click on one of the .7z files and hover over "Open with..." and choose "The Unarchiver"
3) Repeat the previous step on the second .7z file. 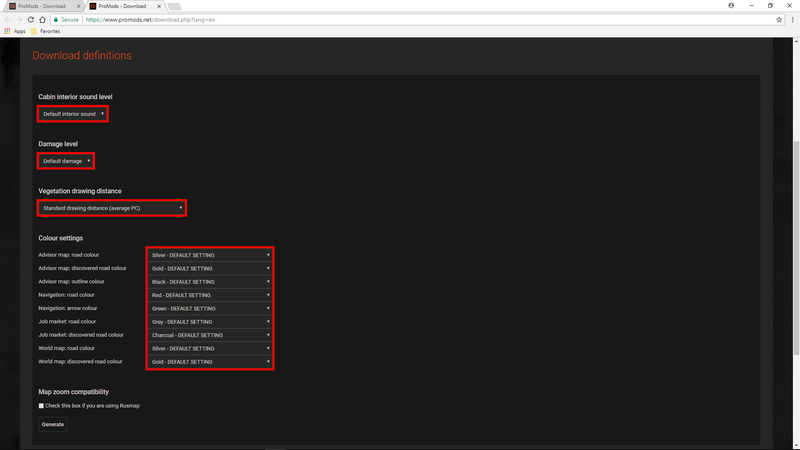 4) You will now have 2 folders, you now just need to move the .scs files in each folder to your mod folder. 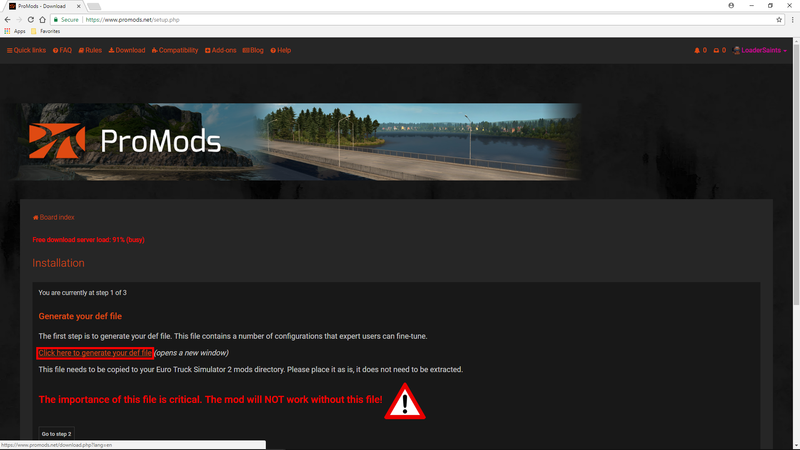 If you need more help, ask here on the Promods forum or look at the PC Tutorial above this one. I locked it, made it sticky and made it a global announcement.